WOWCube—resembling a Rubik’s cube, the world’s first portable twisty game console allows gamers to play in both virtual and normal realities. Voltron Legendary Green Lion Droid—Grab a selfie with this replica from the Voltron animated series, built from resin and animatronics. Toy and Hobby Exhibit by Darth Tucker—This San Diego company will show how 3D printing has enhanced user experiences for the comic book and toy industries. 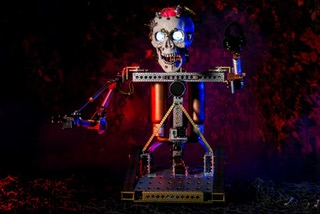 DIY Animatronics—Jarvis the steampunk robot and his maker will display mechanisms available for builders of all skill levels to build their own animatronic robot. Sprite Lights—A wearable, programmable LED matrix which allows users to share their unique style and identity through patterns, colors and animated artwork. Robot by Matt Q. Spangler—the diminutive Robot goes on larger-than-life adventures doing what we consider the simpler things – eating, exploring and meeting animals. Join him on a journey as seen through his tiny robotic eyes. Advance ticket adult prices start at just $21, children at $13. Admission includes entry to all participating venues. To purchase tickets, visit http://sandiego.makerfaire.com/ticket/. Purchasing a weekend pass will allow visitors time to experience all of the museums participating in this event. Maker Faire is an award-winning, family-friendly event celebrating technology, education, science, arts, crafts, engineering, food, sustainability, and more. It has become part of pop culture, a place for experiential marketing, debuting new technologies and inventions, and celebrating geekdom. Maker Media produces two annual flagship Maker Faires, partners with museums to produce Featured Maker Faires, and works with communities to license Mini Maker Faires around the world http://makerfaire.com/.